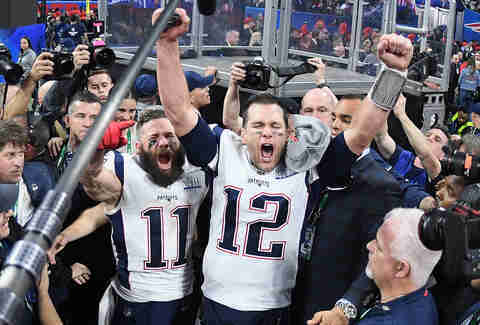 Super Bowl 53, AKA The Big Game, AKA the biggest night in advertising, AKA the triannual Tom Brady coronation, was a total snoozefest. 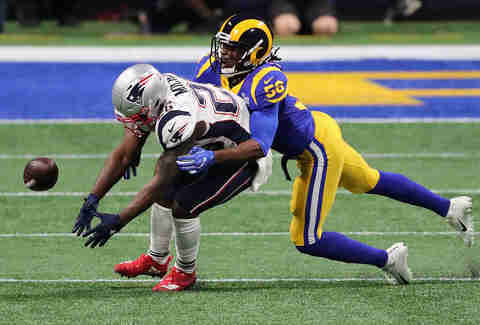 It was the second-lowest-scoring first half in Super Bowl history, with the New England Patriots going into halftime with a 3-0 lead over the Los Angeles Rams. By comparison, the second half was the greatest show on turf, ending with a 13-3 Pats victory. On top of it all, the halftime show performer was in flux after several potential artists (including Rihanna and Pink) reportedly refused to perform over the NFL's alleged blackballing of former San Francisco 49ers quarterback Colin Kaepernick. Travis Scott in particular faced pressure to back out, but eventually he took the stage with Maroon 5 and Atlanta native Big Boi, while the #ImWithKap hashtag floated around Twitter. The final scoreline may have been relatively close, but the game left a lot to be desired. Nevertheless, we cobbled together the few memorable moments, which you'll try to erase from your memory because they remind you of that Sunday you wasted four hours watching one of the most boring NFL games of the season. Gladys Knight gave the best performance of the night. Yes, the National Anthem turned out to be the most memorable event of the evening, and not because anyone kneeled. At the time, it seemed as though the Empress of Soul and Atlanta native had given a particularly moving rendition of "The Star-Spangled Banner," but no one knew there would be little to come in the next four hours that would surpass it. Former George W. Bush press secretary Dana Perino made the world's worst queso. The current Fox News anchor made what she claims was queso, but what looked a lot more like... a pile of industrial waste? A grease trap? Human excrement? Twitter promptly ratioed her with all kinds of suggestions, clapbacks, and similarly awful cooking "accomplishments." The teams combined for 3 points in the first half. What's offense? In a building where the soccer team Atlanta United scored 3-plus goals 10 times last season, two of the NFL's best offenses couldn't get anything going. Only the infamous 2-0 scoreline of Super Bowl IX topped it for impotence. And no one remembers that one, either. No one played the SpongeBob song at halftime. Even though Maroon 5 headlined a wildly uneven halftime show, the band at least followed up on their promise to pay tribute to a legendary performance of yore: The one that Squidward, SpongeBob, Sandy Cheeks, and Patrick gave at the Bubble Bowl. C'mon. You know the one. In the 2001 SpongeBob Squarepants episode "Band Geeks" the seabound gang does a rendition of "Sweet Victory" for cheering humans. After the show's creator, Stephen Hillenburg, died from complications of ALS in 2018, fans circulated a petition asking that the song be played during the Super Bowl. Adam Levine's tribute to the dude who lives in a pineapple under the sea was brief; SpongeBob didn't even get a solo. Instead, the show quickly moved on from the Bikini Bottom residents so Travis Scott could take the stage. Adam Levine asked, "Can I play guitar for you right now?" Sure, if it means you'll stop singing! The progressively less-dressed Maroon 5 front man whipped out his guitar chops after politely asking the audience for permission. It was a nod to Prince, and like all nods to Prince, it came off a bit flat. Big Boi wore a giant fur coat during his halftime performance. And PETA was not happy! When you're including a fur coat in a roundup of the most memorable moments in a Super Bowl, it's pretty safe to say the game wasn't good. Like, at all. Bud Light's "Dilly Dilly" ads share a universe with Game of Thrones CONFIRMED. Like the proverbial (and actual) Energizer Bunny, the Bud Light "Dilly Dilly" campaign just keeps on going and going. One of the beer brand's Super Bowl spots seemed to be just another installment in the increasingly stale franchise: Our catchphrase-coining king is watching a jousting tournament when his favorite knight, decked out in Bud Light armor, is unhorsed. The camera pans up to reveal that the culprit is... the zombified Gregor Clegane, AKA the Mountain That Rides, AKA that huge dude who guards Cersei, who of course then crushes the Bud Knight's eyeballs and head in. And then Drogon unleashes fire on the tournament grounds as the Game of Thrones theme song begins. A few things: 1) cross-branding like this is always painful and never as fun as the people behind it intend. 2) The "Dilly Dilly" campaign launched in August 2017 to coincide with the Game of Thrones Season 7 finale, and now they share a universe. 3) If only Gilly had starred in this ad so we might have heard everyone say "Gilly Gilly!" -- a missed opportunity. Roger Goodell and Jeff Bezos apparently hung out together. There was all sorts of bad juju in Atlanta Sunday night, as two of the world's most powerful -- and most reviled -- men in America hung out at the most stale Super Bowl in recent memory. Yes, that's NFL Commissioner Roger Goodell and Amazon CEO Jeff Bezos, just hanging out, being regular, normal, super-wealthy people with exclusive access to sport's hottest ticket. Cher got really excited about the Rams' only field goal. Who knew Cher was a Rams fan? On a tough night for her cohort, the legendary pop star and actress went bonkers over what turned out to be Los Angeles' only score of the night. In her defense, the kick tied the game, 3-3. Have you heard that the game wasn't all that good? Tom Brady's Patriots won the Super Bowl. Again. 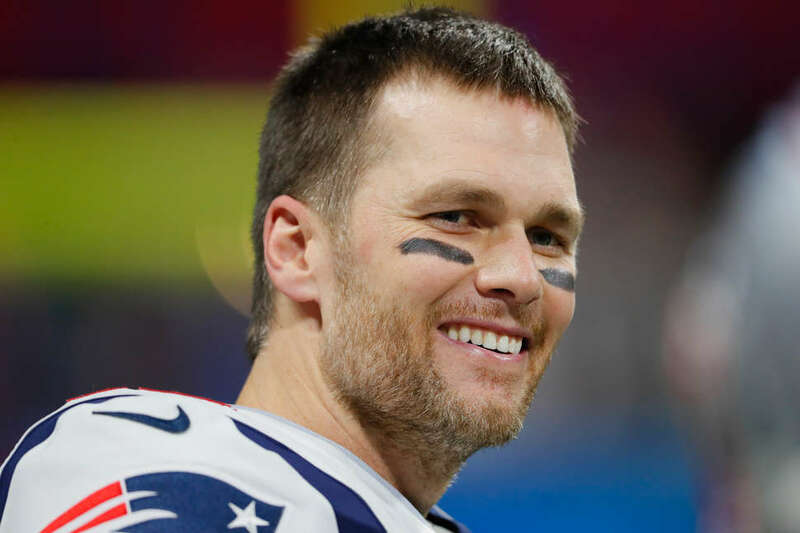 No one will claim it was pretty, but after a defensive struggle resulted in a 13-3 Pats win, it's now impossible to controvert the fact that Tom Brady is the greatest quarterback of all time. He's 41! He's won six Super Bowls! He's played in NINE! That's unlike anything football fans have ever seen, and when the Bill Belichick and Tom Brady tandem inevitably dissolve, we'll never see anything like this again. Hate 'em all you want, but it would be better if someone actually beat them on a consistent basis. Cher sums up how everyone outside of New England feels. Who knew Cher was such an astute NFL commentator? Follow Thrillist Entertainment on Twitter: @ThrillistEnt.